The recent economic conditions have significantly impacted the budgets of most every business in the world. Even those that are thriving are more conservative about spending for fear of deeper and extended recession over the coming months and years. This has made it more difficult than ever to gain funding for BI initiatives. For these initiatives to garner their fair share of the limited funding available in this economy it is important to build a case that documents how investing in BI addresses the common fears created by this downturn but also how it is critical to capitalizing on the (hopefully) inevitable recovery. 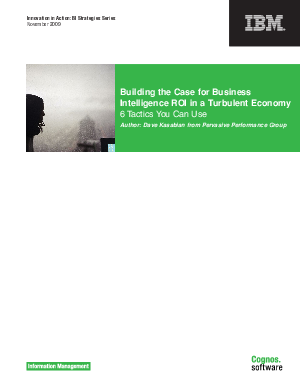 This paper describes 6 tactics to strengthen the case for BI investment in this environment.